Dean Cain came close to getting married to an American Singer in 1997. Unfortunately, a year later, he broke up with her citing that she wasn't the kind of wife he had been looking for nor the type of mother he wanted for his son. Since then, he has been on a look out for his Louis Lane. The American actor is best known for his portrayal of Clark Kent--Superman in the TV series named Lois & Clark: The New Adventures of Superman. As of June 2018, Cain is hosting a television infomercial for The National Real Estate Network, a show that teaches the art of flipping real estate. He was also sworn in as an officer for the Idaho Police Department as Reserve Officer on 19th June 2018. After enduring a career-ending injury during his time at Buffalo Bulls as a football player, Dean turned towards acting hoping for a fresh start. He began his career shooting dozens of commercials until finally, he earned his chance to star on famous television shows like Grapevine, A Different World, and Beverly Hills, 90210. Similar: NFL Reporter Suzy Kolber Husband Is A No Show, A Gay/Lesbian As Single Mother? His most prominent role till date came in 1993 in the television series Lois & Clark: The New Adventures of Superman where he portrayed the main protagonist. It ran for four seasons, ending in 1997. Since then, he has done many television shows as well as reality shows. He has also starred in sixteen Christmas movies. However, he is still regarded as one of the best actors to play Clark Kent, and his alter ego, Superman. In 2001, Dean starred in the Indie Comedy The Broken Hearts Club where he took the acting challenge of portraying a gay character. The movie was a funny and real story about a group of gay men in Hollywood. He was hoping that his performance in this movie would make people acknowledge him for more than playing Superman once. However, that didn’t happen. 'You're like an arrow; you're so straight.' But I do have so many gay friends that I don't even think about it." For the record, Dean is a straight, single, and an unmarried dad. 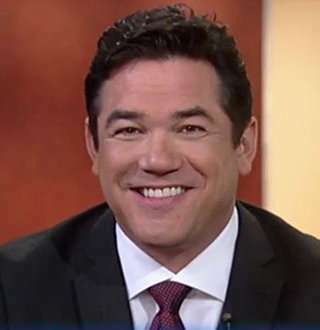 However, Dean Cain is a vocal supporter of gay marriage and has many gay friends in his circle. Born on 31 July 1966, Dean was born to actress Sharon & Roger Tanaka in Mount Clemens, Michigan. He is of mixed ethnicity and has French Canadian, Irish, Japanese and Welsh ancestry. When he was three years old, his mother married film director Christopher Cain, who adopted him and his brother, musician, Roger Cain. In 1969, they moved to Malibu, California. He later had a step sister in actress Krisinda Cain. He went to Santa Monica High School, where he excelled in sports. He played alongside Charlie Sheen, Rob Lowe & his brother, Chad, who is now top rated actors, on the baseball team when they were children. Dean is also a single parent of his son, Christopher Dean Cain named after his adoptive father. Christopher's mother is his ex-girlfriend, Samantha Torres, who conceived him on 11 June 2000. After graduating from high school in 1984, Dean attended Princeton University where he excelled at football. During that period, he also dated actress Brooke Shields, who later revealed that he took her virginity. But because her mother was a devoted Christian, she was overwhelmed with guilt, and the pair soon broke up. Four years later, he graduated college with a Bachelor of Arts in history. He submitted his senior thesis titled The History and Development of the Functions of the Academy of Motion Picture Arts and Sciences. During 1997, Cain started dating singer Mindy McCready. The couple became so much engrossed in each other that they progressed quickly and became engaged. However, instead of their relationship reaching to a swift conclusion, they broke up the following year. Tragically, his former girlfriend took her own life in 2013; she shot herself. Dean was saddened by the news but not surprised. Speaking after her suicide, he revealed details as to why he broke their engagement. She was a poisonous person and not someone he wanted to spend his life together, he said. He added that she sucked the joy out of his life in such a way that he had to leave his own home for a hotel to escape her. His late girlfriend left behind two sons, and the first thing Dean did was to convey his condolences to them on their loss. During the middle of 2016, amidst Rebecca Adlington’s divorce with Harry Needs, Dean found himself being linked to her. Dean spent hours consoling her after the saddening news. Dean and Rebecca were good friends, but as weeks went by, they grew closer. They were continually visiting each other’s rooms at night and made no attempts to hide their togetherness. You May Also Like: Who Is Tituss Burgess' Partner? Gay Man Married Or Rising From Ruins? Rumors between them started to spread with headlines stating ‘Dean And Rebecca spent the night together!’. Dean denied those rumors stating that he was only a good friend and providing her with a shoulder to cry on during her distress. Not just that, he also revealed that he was looking for someone to get married to. However, he stressed that he had not met the perfect wife material; someone with whom he could start a family and raise his son.